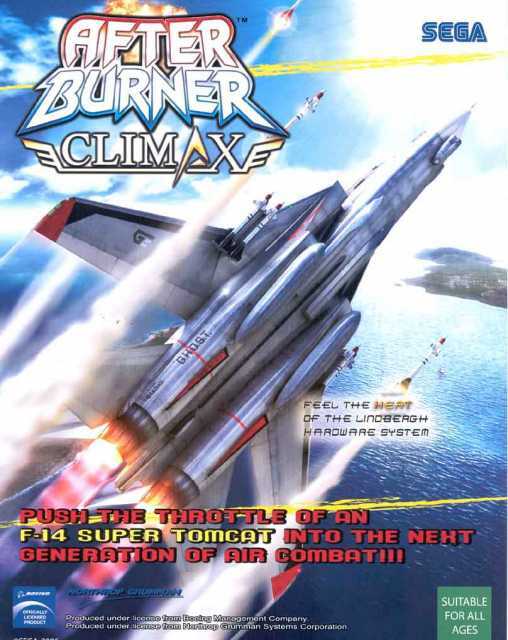 A sequel to the classic After Burner arcade games, After Burner Climax is an arcade game in which players pilot a jet fighter through hectic, enemy-filled set pieces. Seated in a special moving cabinet, gamers use a piloting stick to co...MoreA sequel to the classic After Burner arcade games, After Burner Climax is an arcade game in which players pilot a jet fighter through hectic, enemy-filled set pieces. Seated in a special moving cabinet, gamers use a piloting stick to control their jet of choice from a 3rd person view.